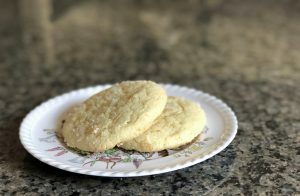 We fell in love with lemon sugar cookies from eating them at Zoe’s Kitchen, so I searched the interwebs for something that looked similar. I always read the comments on recipes I find on the internet – you can learn amazing tips & tricks and get insight into how to make sure yours turn out as the pictures. I found several recipes and (after reading through all the comments for them) landed on my own version that, after making them twice in two days, I think is perfect. These are super easy to whip up and pair oh. so. nicely. with a scoop of vanilla ice cream. Sift flour, baking powder, salt and cream of tarter. Mix butter, sugar, lemon zest. Add egg, lemon juice, extracts and food coloring. Don’t over beat. Reduce to the lowest mixing speed and add dry ingredients. 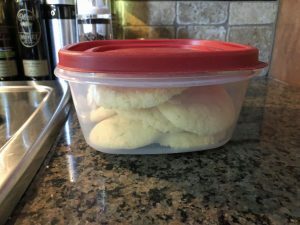 Refrigerate dough for 15-20 minutes to chill. Make your lemon sugar coating by mixing zest with sugar. Roll dough into 1 1/2 inch balls and roll through lemon sugar. Place 2 inches apart on parchment paper topped cookie sheets. Cook 12 – 14 minutes. Let cool 3-5 minutes and then transfer to backing racks to finish cooling. Just like with other sites that post recipes, let me know in the comments below if you make these & how they turned out. Good luck!